Well, here's the review of Milwaukee's Best Ice! I don't know why this is hard to find here, but it is. I've tried the regular Milwaukee's Best several times and was a bit underwhelmed... except for the price. So, the other day I was buying some ingredients to cook some tasty grub because I'm awesome like that, and noticed Milwaukee's Best Ice. 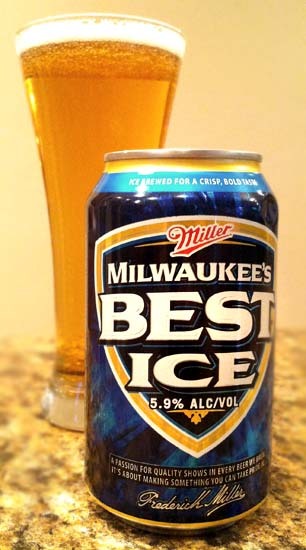 I don't know if I've been hiding under a rock or what, but I guess I just didn't realize they made an Ice-version of Milwaukee's Best. Ice, of course, refers to the brewing method where beer is brewed and filtered at sub-freezing temperatures so ice can be filtered out, thereby raising the alcohol content slightly and creating a slightly smoother beer. Making an Ice Brewed beer is essentially borrowing a technique the early colonial settlers used to make applejack (freezing fermented apple mash and filtering off the ice). So, while it's not a new technique, it wasn't really applied to beer until the 1990's. But, I'm getting off track here... back to this beer! Milwaukee's Best Ice is a respectable 5.9% ABV. It pours a clear, golden hue with a fairly thin and quickly dissipating head. It smells pretty mild and of light toasted malts and bread. Tasting brings what is expected: light malts, white bread notes, and some cereal grain sweetness and corn flavors (although not nearly as sweet and off-balance as Steel Reserve). While this tastes very similar to a lot of similar cheap beers, the body is a bit heavier, especially for an Ice-Brewed beer which I find to be a good thing! Is it a tasty craft beer? No. Is it a slightly better than average cheap, ice beer? Yes. I actually prefer this to the regular Milwaukee's Best and a lot of other ice beers by quite a bit. This would make a good party beer for serving a lot of people who aren't into craft beer and for CHEAP! Plus at 5.9% alcohol, it's a pretty good bang for your buck! Drink This: if you want a cheap beer with a slightly heavier body and slightly more alcohol. Don't Drink This: if you're looking for a hoppy or dark craft beer. This is neither. Not at all. The choice is yours! I used drink the "Ice Beast" as we (my other friends working crappy low/minimum wage jobs) would get together and watch football on the tube, or listen to metal. After about a year or so of doing that it was a great incentive to find better jobs and make a little more money. 2011. Theme images by Ollustrator. Powered by Blogger.